©1988 Paramount Pictures. All rights reserved. When a brash Starfleet commander (Robert Schenkkan) boards the Enterprise to conduct a top-secret investigation, Riker (Jonathan Frakes) gets the impression that he is the subject of the inquiry. But after Riker hears the investigator asking crew members about Captain Picard (Patrick Stewart), he realizes it is the captain's competency that is under question. While Wesley Crusher (Wil Wheaton) takes the grueling Starfleet Academy entrance exam that may launch his Starfleet career, Picard struggles to defend his reputation and keep the command of his starship. 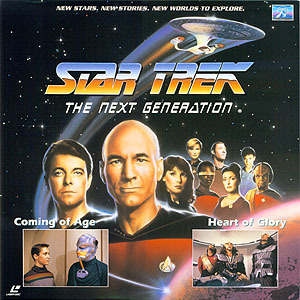 Lt. Worf (Michael Dorn) is torn between his loyalty to Starfleet and his Klingon heritage in this thrilling Next Generation adventure! After the Enterprise rescues a group of Klingons from their disabled ship, Picard (Patrick Stewart) receives a transmission alerting him that the men are wanted fugitives. Before the captain can respond, one of the Klingons has taken over engineering and threatens to destroy the starship. When Worf confronts his fellow Klingon, the criminal appeals to Worf's warrior instincts and begs the lieutenant to join his terrorist cause. Now Worf must decide whether to save the Enterprise...or destroy it.